SANTA FE – Young hunters who did not draw a big-game license will have another shot to go hunting this coming season when the Department of Game and Fish puts more than 2,000 antlerless elk licenses up for sale at 10 a.m. MDT Wednesday, July 10. The online sale will be first-come, first-served on the department website, www.wildlife.state.nm.us. 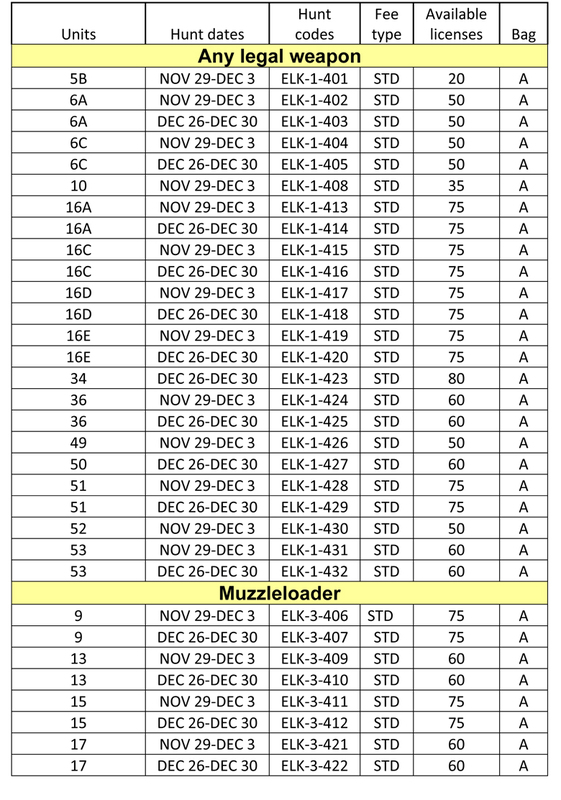 The sale includes almost 1,500 licenses for hunters using any legal weapon and 540 licenses for hunters using muzzleloaders or bows. For the first 14 days, the sale will be open only to New Mexico resident youths younger than age 18 who successfully applied but were unsuccessful in drawing any big-game license this year. Beginning at 10 a.m. July 24, the sale will be open to all youths younger that age 18, resident or nonresident, who did not draw a 2012-13 elk license, whether they applied or not. New Mexico law requires all hunters younger than age 18 to have passed an approved hunter safety course or to be enrolled in the Department’s new Mentored-youth Hunting Program before purchasing or applying for a hunting license. The Mentored-youth Program allows young hunters to purchase or apply for licenses for up to two years before taking a hunter safety course. Participants receive a Mentored-youth number once they complete a simplified online training quiz. More information about the program and a list of available classes are available at www.wildlife.state.nm.us or by clicking here. State law also requires all hunters to have purchased either a Game-hunting or combination Game-hunting and Fishing license before purchasing a big-game license. Those licenses can be purchased online at www.wildlife.state.nm.us, or from any license vendor. Hunters are strongly advised to review their online customer account or create a new one before the sale begins. Popular hunts sell out quickly, although many licenses are expected to be available after the 14-day residents-only period. Customers can get assistance by calling the Department’s toll-free information line, (888) 248-6866.